Johannes Schmidt was born April 26, 1877 in the colony of Brunnental, Russia, the son of Johannes Schmidt (born 1845 in Dietel, Russia) and Catharina Margaretha Molko (born 1848 in Warenburg, Russia). Johannes was confirmed in 1892. Anna Margaretha Hartung was born on December 31, 1877 in Brunnental and was confirmed in 1893. Her parents were Johannes Jacob Hartung (born 1840 in Frank, Russia) and Catherina Elisabeth Zitzmann (born 1842 in Frank). Johannes and Anna were married on January 19, 1898 in Brunnental. Their first child, Johannes, was born on March 31, 1898. Two more children followed: Maria, who was born November 4, 1899 and Heinrich who was born December 23, 1901. A daughter, Anna Marie (known as Marie), was born August 12, 1903. Another daughter with the same name, but known as Anna, was born on February 26, 1905. The last child that would be born in Russia, a daughter Amalia (Molly), arrived on October 9, 1906. Johannes and Anna suffered a series of tragedies in 1907. Three of their children: Maria, Heinrich and Amalia died, possibly from a cholera epidemic that swept through the Volga basin that year. Many Brunnentaler's were emigrating from Russia and Johannes and Anna decided to leave their homeland to start a new life in Amerika. Johannes' brother, Johann Philip ("Philip"), had already emigrated and was living in Portland, Oregon. 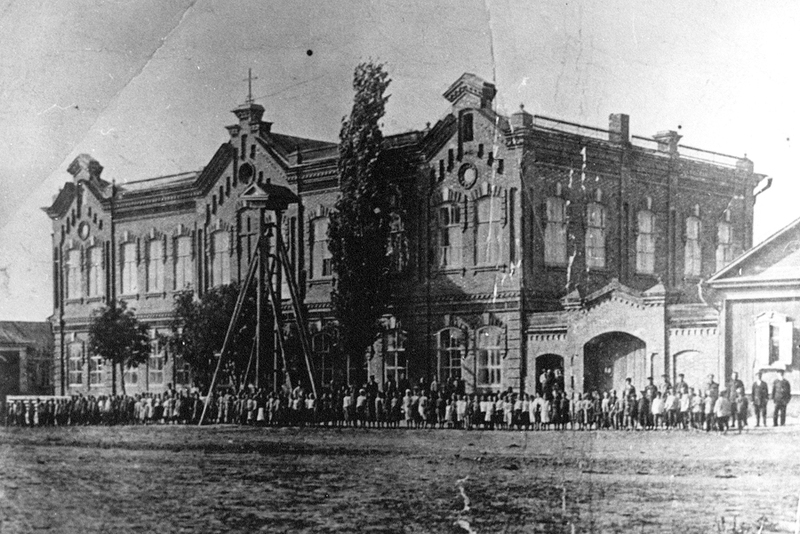 All of the Brunnental residents who emigrated in 1907 are shown standing in front of the school. Johannes Schmidt, Anna Margaret Schmidt and their children are probably included in this photograph. Photograph courtesy of Sherrie Gettman Stahl. The Schmidt family departed from Brunnental in the fall of 1907 and traveled by train on the Libau-Romnyer railroad to Libau, Russia (now Liepaja, Latvia). In October, they boarded the cargo steamship Omsk which was bound for Hull, England, a large seaport on the eastern coastline at that time. The Omsk was not built primarily for passengers but could carry up to 24 people in addition to cargo. After disembarking at Hull, the family then boarded an emigrant train which traveled west across England to Liverpool. Here the family boarded another steamship, the Kensington, which was bound for Québec, Canada. 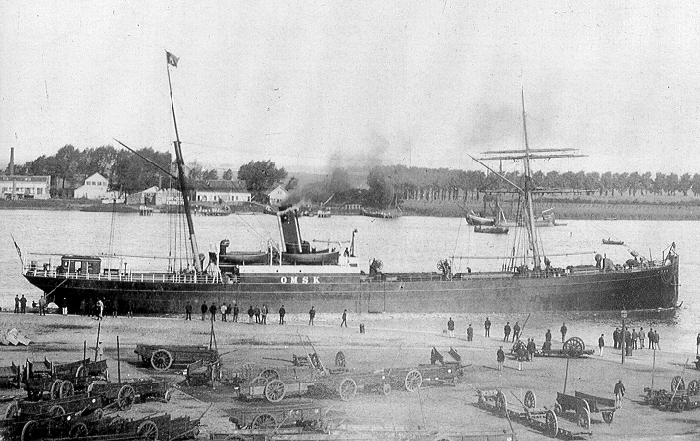 The Kensington, which was part of the Dominion Line, sailed from Liverpool on October 24, 1907 under the command of Captain William Roberts. After a sea voyage of 2,613 miles the Kensington arrived at Grosse Isle near Québec at 4:00 a.m. on November 3, 1907. The ship's passenger list shows the Schmidt family members included: Johannes (age 31), Anna (age 29), Johannes (age 8), Marie (age 4), Anna (age 2) and Johannes's mother, Margaretha (age 58). 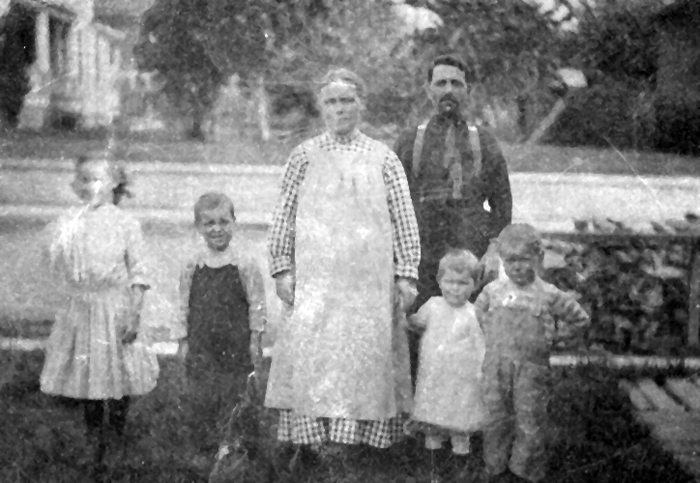 Johannes and his family were traveling with a group from Brunnental who were all bound for Portland. The group members were listed together with consecutive Railway Order Numbers. Elias (age 29) and Marie (age 27) Hergert. Elias Hergert would later become an ordained minister and the pastor of the St. Paul's Evangelical and Reformed Church in Portland after his brother Jacob's death. There were 1,007 passengers aboard the ship and 881 traveled in steerage class. The total carrying capacity of the Kensington was 1,503 passengers. Upon arrival, the ship anchored at Grosse Isle which is located in the St. Lawrence River northeast (downstream) of Québec. Grosse Isle is sometimes referred to as the Canadian Ellis Island. At 6:25 in the morning, two medical examiners began a health inspection of each passenger on the upper deck of the ship. Three people from the ship were held in quarantine at Gross Isle because of Scarlet Fever. Fortunately, the Schmidt family was not among those held at Grosse Isle and the inspection of passengers concluded at 9:00 am. After the inspection, a certificate that the ship was "clean" was signed by the medical examiners and the Kensington proceeded upriver to the dock at Point Lévis on the south shore of the St. Lawrence River opposite of Québec City. The steamship Kensington of the Dominion Line. ​The passengers disembarked from the Kensington and boarded a Special Train on the main branch of the Grand Trunk Railway which departed at 2:00 in the afternoon. The Schmidt's traveled under Railway Order Number 26413. Their passage had been paid by Johannes's brother, Johann Philip Schmidt, who had arrived in the United States in 1900. In 1907, Philip was living with a Hergert family at 447 Failing Street in Portland. From Point Lévis, the special train traveled southwest on the Grand Trunk main line, crossing to the north side of the St. Lawrence River at Montreal. The train continued to Toronto and Detroit where the Schmidt's are recorded as entering the United States on November 4th. The family had $34.00 when they entered entered the country. The train likely continued on to Chicago, the terminus of the Grand Trunk Railway. In Chicago, the Schmidt's along with the other families from Brunnental likely changed to a Northern Pacific train to continue their journey to Portland, Oregon. When they arrived at Portland's Union Station, the entire Brunnental party was likely met by family and friends who were expecting them. The Schmidt family settled in the Volga German enclave located in the Albina area. Their exact residence in the early years after their arrival isn't known. Johannes and Anna Schmidt became members of the St. Paul's Evangelical and Reformed Church upon their arrival in Portland and remained part of this congregation until their death. The first pastor of the church was Rev. Jacob Hergert who was also from Brunnental and someone they likely knew very well. Jacob's brother, Elias, had traveled from Brunnental to Portland with the Schmidt's and would became pastor of the church in 1925 after Jacob's death. According to the 1910 U.S. Census, the Schmidt family lived at 912 Grand Avenue North and Johannes was working as a laborer installing sewer lines. 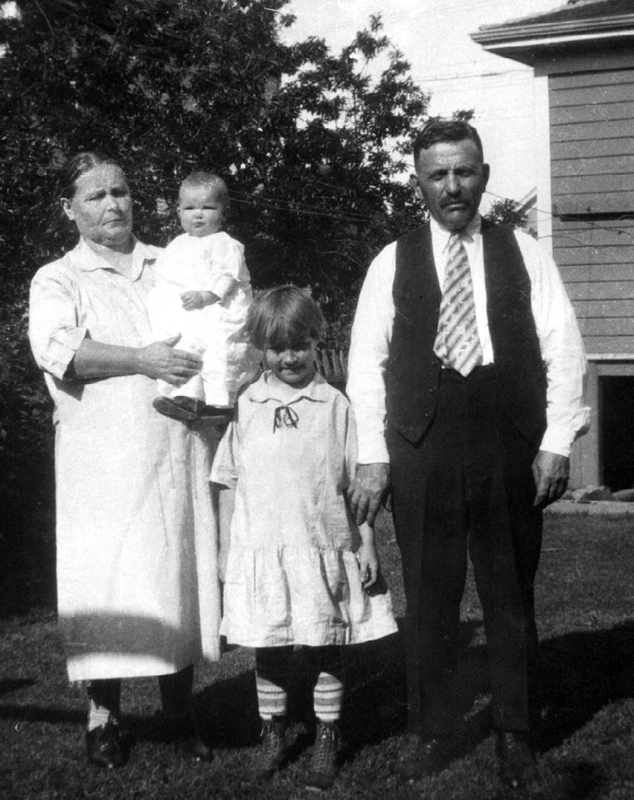 Less than a year after their arrival in Portland, Johannes (now known as "John") and Anna celebrated the birth of their first American born child, Jacob, on April 4, 1908. Another son, George, was born on March 26, 1910 followed by Alexander on December 3, 1911. The Schmidt famly in Portland, circa 1913. From left to right: Marie (Mary) Schmidt, Jacob (Jake) Schmidt, Anna Schmidt, Johannes (John) Schmidt, George Schmidt, Alexander (Alex) Schmidt. Photograph courtesy of Steven Schreiber. ​A baby, Robert was born on March 11, 1913 and sadly died on the same date. Another tragedy struck on April 5, 1911. Johannes's brother, Philip, was killed when a sewer trench he was working in collapsed causing him to suffocate. On May 7, 1914, Anna and Johannes celebrated the birth of their son Fredrick. Another daughter, Lydia became part of the family on March 6, 1916. Two more children would become part of this large family, Heinrich (Henry) was born on February 13, 1918 and Esther Grace was born on March 14, 1920. John's World War I Registration Card shows that he is working as a carpenter for the Oregon, Washington, Railway and Navigation Company. As a result of anti-German feelings during the war, the Schmidt's began to anglicize the spelling of their surname to Smith. The 1920 U.S. Census shows the John, Anna and family living at 861 Grand Avenue North. John is working as a carpenter at the ship yard in Portland. Anna Schmidt holding her granddaughter, Donna Hawes, the daughter of Mary (nee Schmidt) Hawes. Esther Smith stands with her father Johannes Schmidt. The photograph was taken in Portland about 1927. On February 8, 1922, John filed a Declaration of Intention to become a citizen of the United States. This document shows that the family was living at 825 E. 13th Street N. and John was working as a carpenter. ​George Melcher kept in step with them and continued his pleasantries. John died on November 1, 1928 from acute lobar pneumonia at the age of 51. He is buried at the Rose City Cemetery in Portland. Without a husband, Anna's older sons and daughters helped raise their younger siblings and provided much needed financial resources for the family. Anna's youngest son, Henry, was a member of the Company C, 21st Armored Infantry Battalion, which was part of the 11th Armored Infantry Division. Henry's company fought in key battles leading to end of World War II. Sadly, he was killed in Germany on March 6, 1945, shortly before the end of the war. The news of Henry's death was devastating to Anna. Henry was initially buried at a military cemetery in Belgium, but the family requested that his remains be brought to Portland where he was interred at Rose City Cemetery. In her later years, Anna suffered from dementia (probably Alzheimer's Disease). After a life full of joy and sadness, Anna died on October 16, 1950. She was also buried at the Rose City Cemetery. Researched and written by Steven Schreiber.